It's the only way America can be great in the future. The full State of the Union Address can be viewed at this link. In his recent State of the Union address, President Donald Trump spoke about the progress he has made under his administration and discussed his vision and plans for America's future. As part of this, he renewed his campaign promise to invest in and rebuild America's infrastructure, part of his overarching promise to "Make America Great Again." This was not surprising to me—Trump had made infrastructure renewal one of his key political positions ever since he started running for president. However, over the last two years, he has been all talk and no action on this promise. He needs to understand that if he wants to make our country greater, he must make infrastructure spending, especially spending on public transit, a priority of his administration. On paper, Trump seems to be strongly pro-infrastructure and pro-transit. During his campaign, he expressed support for bringing high-speed rail to the US, despite opposition from fellow Republicans. He stated doing so would create jobs and boost the economy. Immediately after being elected president, he pledged in his victory speech to make America's transportation infrastructure "second to none" and "embark upon a project of national growth and renewal." Almost immediately after taking office, he labeled a number of public transit projects as high-priority, including the Texas Bullet Train, Phase II of NYC's Second Avenue Subway, and Amtrak's Gateway Project. 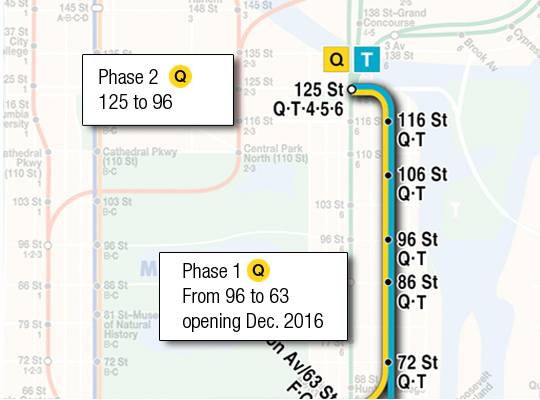 Phase 2 of NYC's Second Avenue Subway, labeled a high-priority infrastructure project by President Trump. But these two years have been all talk and no action. None of the mass transit projects Trump listed as high priority are any closer to completion than they were at the beginning of his presidency. In particular, he has threatened to freeze funding for the Gateway Project, which will rebuild Amtrak and NJ Transit trackage between NYC and Jersey City. Amtrak trains depend on these tracks to travel between Washington DC and Boston, and NJ Transit commuter trains rely on them to transport millions of commuters between Manhattan and suburban New Jersey every day. The existing infrastructure is over a century old and is operating at crush load. But there is no end in sight for this transportation nightmare. Trump has expressed skepticism towards the Gateway Project in the greater NYC area. If President Trump truly cares about American lives, he should do all he can to solve America's transit crisis. America's public transportation network is old, dilapidated, and unable to meet the needs of the future. One of our nation's most critical rail lines is operating beyond capacity. Washington DC's Metro is crumbling after only 40 years in service. Many of our transportation hubs have not been renovated in decades. Countless bridges across our country are structurally deficient. One of our 50 largest cities has zero public transit, and even cities with public transit often have unreliable service and transit deserts. It is frankly embarrassing that a first world country has a third world transit system. Much of America's transit infrastructure is aging and decaying. In the 21st century, reliable public transportation is not a luxury—it's a necessity. As our population grows and resources become scarce, we must transition from private automobiles to efficient and sustainable public transportation. Although cars can go to more places than trains, they cannot move the masses efficiently and sustainably. They will not solve the problems of air pollution or global warming, whether human-operated or driverless. And they will certainly not make getting from point A to point B easier, especially with increased traffic congestion. Investment in transit will give mobility and freedom to millions of people. And it works. Every dollar invested in transit generates $4 in economic benefits. The jobs we create by rejuvenating and building infrastructure will greatly reduce unemployment. Studies have shown that taking mass transit is not only environmentally friendly but also good for health. The benefits that public transportation will bring will make American workers productive, American cities clean, American industries sustainable, and the American economy thrive. Then America will not only be great, but greater than it has ever been. We must invest in America's public transit infrastructure to make America great.